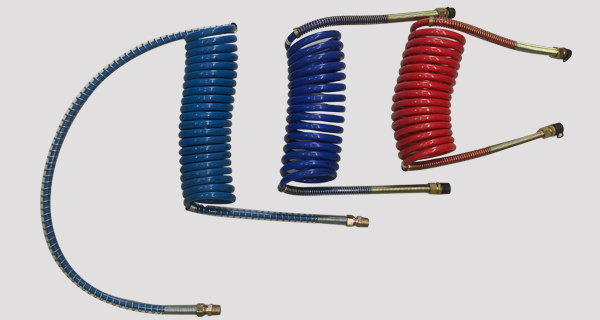 Coiled Nylon Air-Brake Connections designed for just about any tractor/trailer air-brakeapplication you will need for trouble-free service on your rig. The best cold temperature warranty in the business. Years of city delivery and line haul testing. Heavy duty plated spring guards that are rust resistant for added protection. More coils offer you maximum working lengths. No need for pogo sticks or spring hangers. Colour coding gives you mistake-free hook-ups – blue for service, red for emergency. Temperature range: -70oF to +200oF. Wide selection of configurations to suit any rig connections needed.